Aer Lingus has announced its September sale and has embarked on an OOH advertising burst to promote the seat bonanza using multiple data triggers. 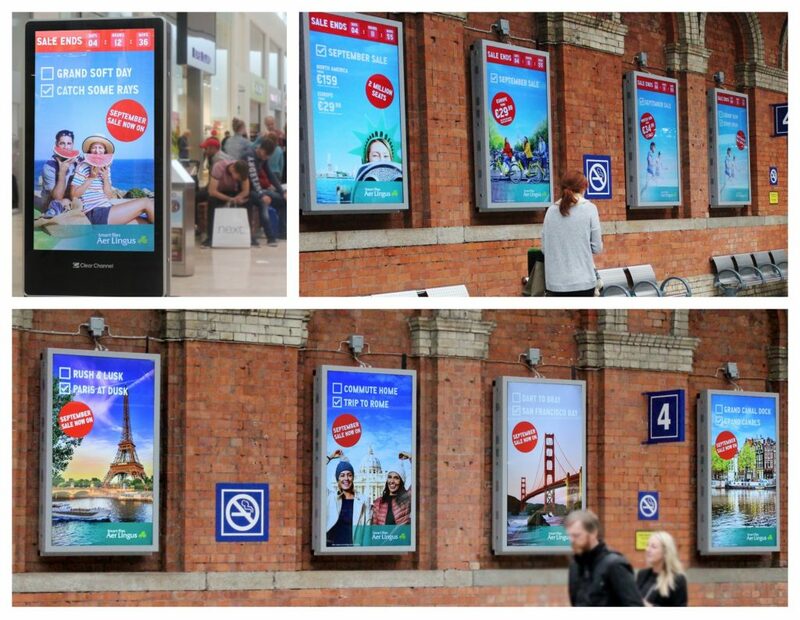 As part of the campaign, the airline has launched an innovative contextual OOH campaign incorporating 48 Sheets alongside dynamic digital screens, the multi-content campaign seeks to highlight its range of winter breaks and earn front of mind awareness. To achieve this, Aer Lingus teamed up with Carat, KK Outlet and PML. Fused with our Pinpoint mapping data to deliver a strategic and targeted approach to its planning, the classic 48 Sheet format delivers coverage and heightened awareness in prime places. For the Digital OOH aspect of the campaign multiple data triggers were incorporated using PML Group’s Dynamic platform to deliver tailored content and deepen the relevance of the messaging to the audience. The Dynamic platform enables digital campaigns to run seamlessly across multiple networks and media owners at scale.